Ensembl 87 has been released! e87 includes an updated Ensembl-Havana mouse gene set, a merge of complete Ensembl gene models and the latest Havana gene annotation. 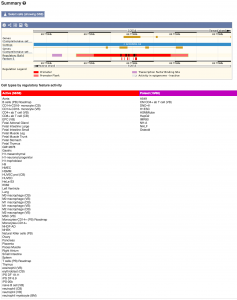 All CCDS genes are included in this gene set. This latest Havana gene annotation includes improved gene models for the mouse olfactory receptors. Over 2Mbp of additional sequence has been added to the mouse olfactory genes to create several hundred multi-exonic models. These new models are based on RNA-seq data from Ibarra-Soria X et. al. The mouse assembly has been updated to GRCm38.p5. The patches for GRCm38.p5 were annotated using a combination of manual annotation, annotation projected from the primary assembly and annotation derived from cDNA and protein alignment evidence. lincRNA data is now available for Tilapia, Opossum and Spotted gar. Due to the high number of epigenomes now available in the Human Regulatory Build, we can no longer show them all by default on the Regulation Summary image, in the Regulation Tab. We have therefore added a table listing the cell types by their regulatory feature activity. Find out more about the new release and ask the team questions, in our free webinar: Wednesday 14th December, 4pm GMT. Register here. Next Next post: Ensembl Genomes 34 has been released!